In some Android devices with Google Now, you can ‘wake up’ the phone and issue voice commands by simply saying “OK, Google” without even touching the phone. This is because the device is always actively listening to voice commands, and the magic words kind of activating the intelligent personal assistant feature. Windows 10 includes Microsoft Cortana, which is similar to Google Now and Apple Siri. However, by default, Cortana does not accept voice commands until you click or tap onto the Microphone icon on the Search box, because Cortana also accepts input via keyboard. Cortana does have active listening feature support, but it’s disabled by default even though you have enabled Cortana. This tutorial guides you on how to enable the Hey Cortana active listening feature, which when turned on, will allow Windows 10 to always listen to “Hey Cortana” magic word to activate Cortana for accepting voice commands. Click or tap on the Search box or Search icon on the Taskbar. Note: If you hide the Search button on the Taskbar, simply open the Start menu and type anything to bring up the Search Windows dialog. Go to Notebook tab (click or tap on 3-stripe icon to bring up the menu bar to help you identifying which one is the Notebook icon). 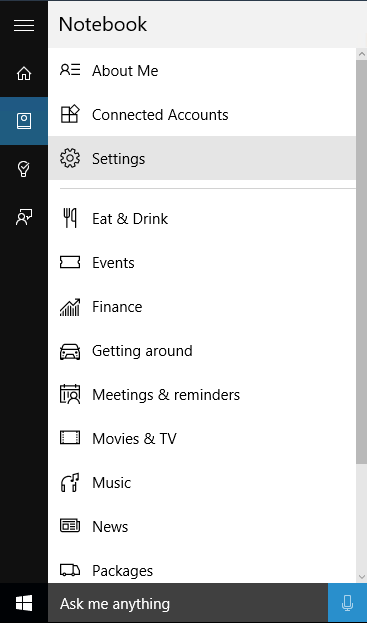 You can skip all above steps by searching for Cortana and Search settings. 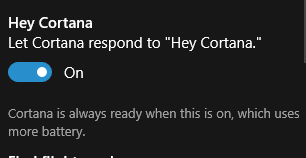 Under Hey Cortana heading, toggle Let Cortana respond to “Hey Cortana.” to On. That’s it. The next time you say “Hey Cortana” into your microphone, you can just follow you another voice command that you want Cortana to do or return results to you. If no voice command is received after been activated, Cortana will ask several phrases such as “what would you like me to do”, “what can I do for you”, “need something”, “what can I help you with”, “what’s up” and etc.